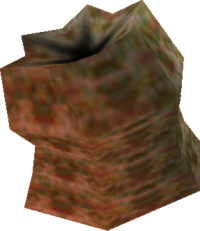 A render of a Like Like from Ocarina of Time, which inspired its appearance in Melee. Like Like (ライクライク, Like Like) is an enemy from the Legend of Zelda universe. Like Likes are recurring enemies in the Zelda games. Possessing a voracious appetite for shields, they ooze towards anyone who dons one - in this case, Link. Upon swallowing him, they rip his shield from him and spit him back out, requiring him to either buy a new one or defeat the Like Like to get it back. In future games, they also go far as to eat tunics if Link is wearing one at the time. A Like Like in the Underground Maze. Like Likes appear as enemies in the Adventure Mode's Underground Maze. They attack by swallowing a nearby character, damaging them and spitting them out after a short while. Attacking the Like Like can KO it when it accumulates enough damage. They can also be grabbed and thrown at opponents for damage. For every Like Like KO, 500 points are added to the Like Like KO bonus. In The Legend of Zelda, these slow-footed monsters inhaled Link and ate his shield, just beating out Wallmasters for the coveted title of "Most Aggravating Enemies Ever." Supposedly, their name comes from an old, almost indecipherable Hyrulian proverb: "Shield-eaters and world leaders have many likes alike." The Like Like is one of the only common enemies from Melee to not appear in Smash Run, but it does have a collectible trophy. Like Like appears as a Spirit for the game's Spirit mode. This page was last edited on February 12, 2019, at 15:02.